As this is a circular walking holiday route you can start and finish at any location on the route. See the Travel section for the best options if arriving by public transport OR Car. Boscastle has been used as the example below but you can start anywhere. Bodmin Moor Ten Tors Challenge Option - For those who have the time to cover the Looe to Boscastle in 3 days. 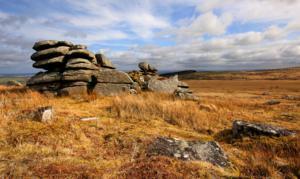 Experienced walkers can opt to take The Bodmin Moor Ten Tors option from Liskeard to Boscastle. Taking in a superb but very challenging day from Liskeard via an ancient stone burial chamber and two stone circles, long lost mining tramways, the renowned Cheeswring Rock Formation and the highlight, 5 miles of open moorland in the most remote part of Bodmin Moor to rejoin the Saints Way at Jamaica Inn. CLICK HERE for details.